Are you ready to give it a try? It won’t take long. You can create your first check stub in a matter of minutes! This is a sample checkstub image, the watermark will be removed after payment. To make your pay stub, you will need to provide some very basic information. Our carefully designed template will take care of the rest. What do we need from you? Once you enter this information, our software will take it from there. You do not have to worry about the math. We will automatically do all of the calculations to make it as easy as possible for you. You can preview your pay stub before you order it. Once you put your information into the template, you will be able to preview your pay stub. Do you see an error? You can easily correct it. If you have any questions or concerns about the preview, please do not hesitate to contact our dedicated customer service team for additional assistance. After you have reviewed your check stub in the preview window, you will be ready to complete your order. After you pay, there is no wait: with Check Stub Maker, you will always get instant delivery of your pay stub. Did you notice a mistake after you already completed the order? No problem. We understand that typos happen. Simply contact us via email within 24 hours and we will make the corrections for you. Step 4: Print Your Pay Stubs! Finally, you will be ready to print your pay stubs for your records. It really is that easy. Of course, one of the major benefits of digital pay stubs is that you will always have access to your check stub. Keep the file on your computer hard drive or on the cloud and you can print another copy any time you need it. When you use Check Stub Maker, there is absolutely no risk to you. Do have a problem with the results? We will fix your issue immediately. If our pay stub experts cannot fix your issue to your satisfaction, then we will offer you a full refund - no further questions asked. We are confident that you will be satisfied with our pay stub software and templates. With thousands of satisfied customers, it only makes sense. Why Choose Check Stub Maker? 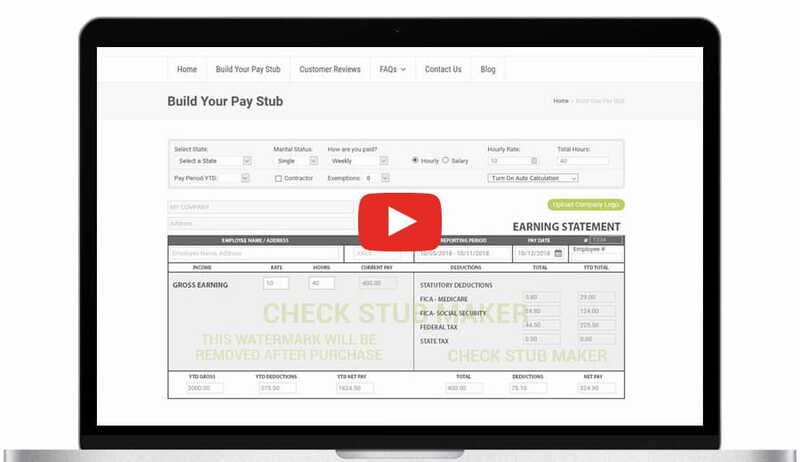 Our pay check stub maker software is the best in the business. We always stay up to date with the latest changes in rules and regulations. You can be sure that you are getting an accurate pay stub. Further, our online check stub maker templates are designed to be user friendly. Unlike some less sophisticated pay stub generators, our software is designed to handle a wide range of different situations. Are you an independent contractor? We can make your pay stub. Are you running a small business and looking to simplify your accounting? We can help. We are proud to offer instant delivery of digital pay stubs to our customers. Not only is it quick and easy to input your information and to complete your order, but you will not have to wait for confirmation. Our customer support team is standing by via email 24/7/365. If you have any issues at all, please do not hesitate to contact us. We will do whatever we can to help you. If there is a mistake on your pay stub - our team will fix it. We make it easy to get your pay stubs quickly. Are you ready to build your pay stub? Enter your information and you will be done in a matter of minutes. If you have any questions or concerns, please do not hesitate to contact our customer support team for help.